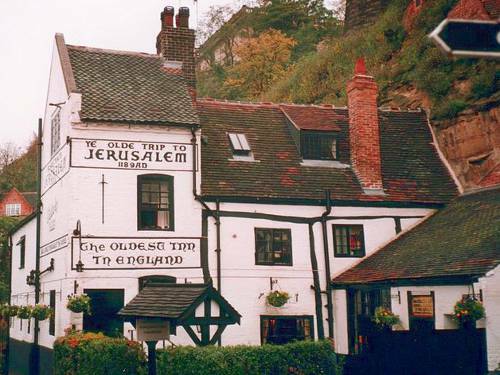 The Olde Trip to Jerusalem is said to be the oldest pub in England. In the olden days, many "inns" and "taverns", the prede­cessors of today's pubs, were catering for visitors and travellers, as well as local customers. The names they gave themselves, and the signs they hung up in the street outside their premises were not just for decoration, but served as publicity, and to clearly identify one pub or tavern from the other. While many of today's pubs are less than fifty years old, almost each one still has its own distinctive name, and in many cases a fine sign to go with it. The oldest named pub in Britain is the Trip to Jerusalem in Nottingham, an old inn beneath the castle, where mediaeval knights used to gather before setting out on the Crusades. Only a few English pubs, how­ever, have names dating back more than three centuries. One of the more common names that does date back a long way is the Rose and Crown, a name first used just after the "Wars of the Roses" in the fifteenth century, when the House of Lancaster (emblem: a red rose) fought the House of York (emblem: a white rose) for the English crown. The name Rose and Crown has been a popular name for inns and pubs ever since. A lot of older pubs have names reflecting local loyalties or loyalty to king and country. Inns situated near the homes of dukes and lords are frequently named after the duke's or lord's family name — especially when the duke or lord in question happened to own the inn, as was often the case. Thus a pub called the Norfolk Arms, whose sign shows a heraldic shield or the por­trait of Duke, is likely to have been named after one of the Dukes of Norfolk (a title created in 1483). As Britain's population expanded in the nineteenth century, so did the number of pubs, many new pubs taking names to celebrate military victories or victorious commanders. Following the Battle of Waterloo, the Duke of Welling­ton became a popular pub name, and fine portraits of the "Iron Duke" still adorn many English pubs. 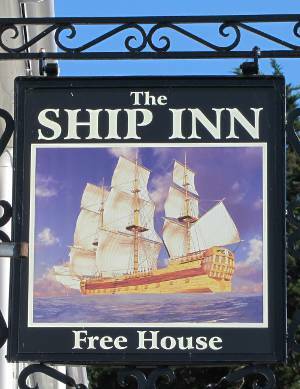 One of many Ship Inns in England. Britain's status as an island na­tion is clearly illustrated by the large number of pubs called The Ship — not just in ports, but in inland towns as well. Each Ship has its own history; here the Ship was founded by a retired seaman, there it was an inn pop­ular with seamen, and in other places just a nice name, though certainly not chosen without some justification. In some places, pubs are named after spe­cific ships, or specific incidents related to the sea; two of the oldest pubs in England fall into this category, the Mer­maid in Rye, named after the mythical figure half-fish, half-woman, about which sailors used to love "spining yarns"; and the Ship and Turtle in Chester, which seems to have been named after some mediaeval ancestor of today's mutant ninja heroes! Local indus­tries or activities have given rise to many pub names. Many university towns boast a College Arms, catering principally for students and staff alike; and many vil­lages contain pubs called the Plough or the Boar's Head. Not all pubs, however, have ancient names. A pub in Bristol which opened in the 1970's, is called the Man in Space, and its sign depicts an Ameri­can astronaut. In the small town of Boston, in the east of England, there is a pub called the Boston Blitz, with a sign showing a man playing American foot­ball; though the sign is new, the name of the pub reflects the history of this small town, from which settlers crossed the Atlantic four centuries ago, to found the city of Boston, Massachussetts. Pub signs have been described as Britain's finest free art collection, and that is not a bad description. Some, though not all, are real works of art, due to skilled artists and craftsmen. Stanley Chew, one of today's most popular sign-artists, has produced about five hundred signs. Some people are worried, how­ever, about the future of pub signs; the big breweries, who own most of Britain's pubs, have begun standardizing some of their outlets, and replacing the old names with standard ones, such as the Harvester, frequently with no picto­rial sign. A minority of pubs have thus lost their identity, as they have been converted into mediocre mass products; yet the majority of English pubs still hold on to their distinctive names, and in many cases their fine signs. English pubs are a fine tradition, with imitations all over the world; and no self-respecting imitation would consider itself authentic without a painted sign! Complete the following extract from the text, adding articles whenever they are necessary. Note any cases where you have a choice..
Only (......) few English pubs, however, have (......) names dating back more than three centuries. One of (......) more common names that does date back (......) long way is (......) Rose and Crown, (......) name first used just after (......) "Wars of (......) Roses" in (......) fifteenth century, when (......) House of Lancaster ((......) emblem: (......) red rose) fought (......) House of York ((......) emblem: (......) white rose) for (......) English crown. (......) name Rose and Crown has been (......) popular name for (......) inns and pubs ever since. (......) lot of older pubs have (......) names reflecting local loyalties or (......) loyalty to king and country. Inns situated near (......) homes of dukes and lords are frequently named after (......) duke's or lord's family name — especially when (......) duke or lord in question happened to own (......) inn, as was often (......) case. Thus (......) pub called (......) Norfolk Arms, whose (......) sign shows (......) heraldic shield or (......) portrait of (......) Duke, is likely to have been named after one of (......) Dukes of (......) Norfolk ((......) title created in 1483). Pub signs are a fascinating form of popular culture, and this article should interest most students. * five language points or words you are not sure of. * five facts about English pubs that you have learnt from the article. Who is James Bond ? Texts and photos on this page © copyright Linguapress -1994 - 2016.